The SOGzilla line from SOG Knives is a quality knife at a low price. The small SOGzilla has a strong, lightweight black Zytel handle with a dual directional texture and notches along the edges for optimal grip. The lock back mechanism is strong and reliable. 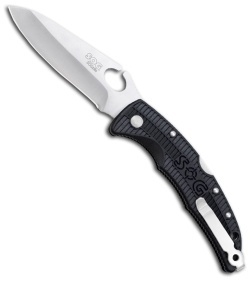 The Small SOGzilla has a satin finished 3.25 inch stainless steel blade with a thumb hole for easy one-handed operation. SOG has included a reversible tip-up clip that allows deep pocket carry.